With the advent of Enterprise Resource Planning (ERP) software, businesses were set to witnessing a new revolution brought by evolving technologies. Old business software such as ERP, CRM, BPM and many more, started to enhance the efficiency of some important business process. For instance, back-office tasks, maintaining customer relationships and many other business tasks became uncomplicated to perform. But on one hand, where old ERP software enhanced efficiency to some extent, it resulted in increased operational costs on the other side. And, this problem of ERP software persists even to this date. But now things have changed drastically. Thanks to disruptive technologies such as advanced automation and Artificial Intelligence (AI), which leave businesses with innumerable options to choose from. The market is witnessing a gradual decline in the demand for old business process management software such as ERP and CRM. Instead, companies have now started adopting advanced BPM software such as Value Creation Automation (VCA). No more investment in additional IT infrastructure, updating ERP software and in training employees with every update. 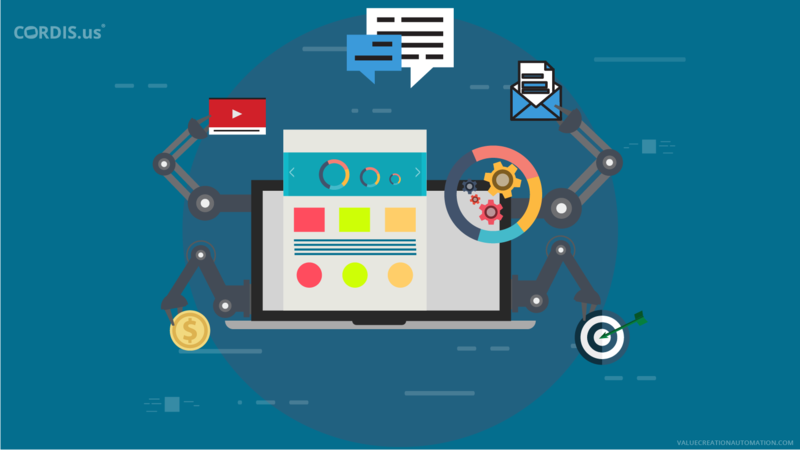 Advanced process automation software such as Value Creation Automation (VCA) is designed to identify and eliminate all sorts of performance bottlenecks. It establishes smooth business workflow and results in achieving set organizational goals within given time and budget. About VCA & why it has an edge over old ERP software? Value Creation Automation has been developed over 8 years of extensive research and study done by the experts at Cordis Technology. VCA is designed aiming to transform the way companies perform diverse business tasks. It automates day-to-day business tasks and supports business organizations in achieving enhanced accuracy and efficiency. The market is full of ERP software vendors. Microsoft Dynamics, NetSuite, SAP, and Oracle are some of the world’s leading ERP software. But VCA is more uniquely designed. It is a process management software that is designed to evolve with evolving technology. It incorporates robust business models; is based on Software-as-a-Service (SaaS); such advanced features gives Value Creation Automation (VCA) an age over many advanced ERP software. Following is some of the many features of VCA, which makes it a cost-efficient and an advanced BPM software. Unlike old ERP software, VCA is an end-to-end business solution. Old business management software such as CRM and BPM is designed to enhance a specific business process. 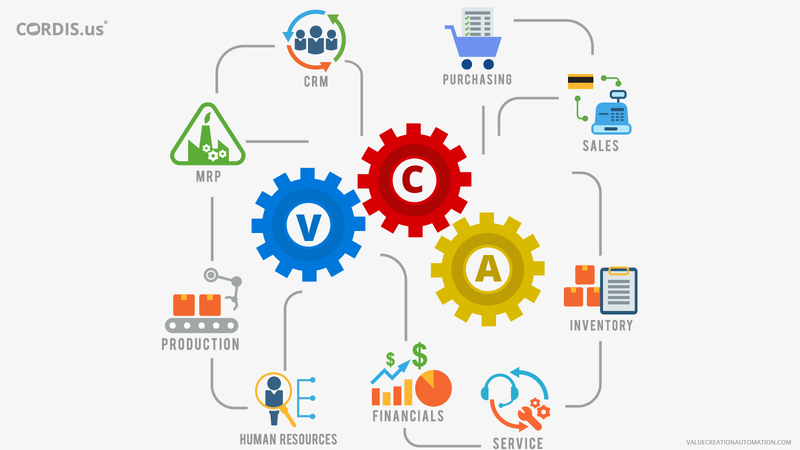 On the contrary, VCA is designed to automate every single task and activity — right from the generation of the business idea, procurement of raw materials, identification and elimination of problem areas, production, sales, and marketing to the delivery of finished goods and services. VCA is unique because it is one platform for all business processes. Business can automate diverse management aspects such as the HR, finance, inventory, supply chain, logistics and many more. It also consists of an inbuilt-CRM that takes care of entire customer-business related affairs. With this, VCA plays a key role in minimizing errors and reducing companies overall operational costs. Automating end-to-end business processes, VCA reduces the unrelenting workload on employees. They can save much time to be creative and put their best effort towards achieving organizational goals. Moreover, advanced automation also saves the human workforce in performing tasks, which involve a high level of risks. Based on the Software-as-a-Service delivery model, VCA offers a more robust approach in comparison to many other advanced ERP software. Enabled by SaaS, VCA play a key role in helping companies in reducing operational costs. It ensures that business tasks are completed within allocated time and budget. Keeps the variation in final products and services to a minimum level. Offers enhanced scrutinization of operations and gives better business control to business leaders, even on the go. Every data pertaining to business is saved in the Cloud and companies need not maintain business transactions on paper. Unlike ERPs, SaaS enables hassle-free implementation and configuration in comparatively less time. With reduced maintenance costs, SaaS-enabled BPM software can be easily afforded by even SMEs. SaaS-enabled VCA prevents business organizations from investing in any other software or server. With SaaS, VCA significantly adds to the flexibility, reliability, and agility of businesses. Owners and Directors can log in to their mobile phones and tablets and can have instant access to entire business data anywhere and anytime. With many such various elements, SaaS-based VCA supports companies in reducing operational costs to a great extent. Another feature that adds to the unique design of VCA is its inbuilt development mechanism, which is backed-up by SaaS. Unlike old ERP software, SaaS allows VCA to install regular updates, which make businesses fit for future performances. With its inbuilt development mechanism, VCA consists of a flexible structure that allows businesses to customize it according to new process requirements. Businesses no more need to invest a huge amount of money in upgrading the system and in training of employees every time. VCA comes along with a visual dashboard, which successfully records and reports every single business transaction in the real time. VCA is also powered by SaaS. It displays details of every business activity and tasks in real-time. Owners, Directors, and Managers can have instant access to data and information across departments and other relevant business functions. Business leaders can have access to the visual dashboard on their mobile phone and tablets, even when they are on the go. This adds to the enhanced visibility of entire business functions. And unlike old ERP software, VCA’s visual dashboard supports businesses in the integration of every single business process. This gives enhanced visibility to Owners and Directors and puts entire business data at their fingertips. With all these factors, VCA boosts the decision-making ability of business leaders. The ability to integrate various processes, departments, and other relevant functions, gives VCA an edge over many of the world’s leading business management software. With this VCA allows instant tracking of information and data across departments, it allows Directors, Managers, and employees to communicate both horizontally and vertically. Having integrated departments and functions, VCA provides an enhanced visibility within processes. This brings every single business activity and transaction to the eyes of Owned make effective business decisions. Moreover, VCA saves data on the Cloud and keeps them integrated. 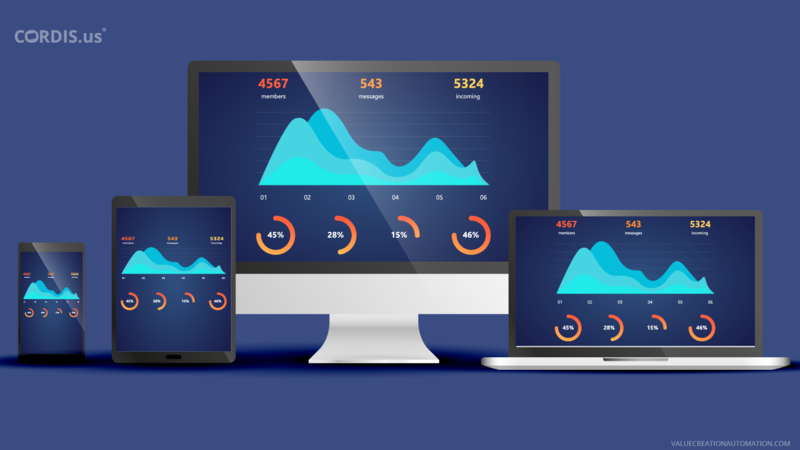 Business leaders can, therefore, have entire data pertaining to various processes such as HR, finance, inventory and much more at their fingertips. It keeps them informed and updated about every transaction and its effect at any given point of time. The success of a business is mostly defined by the value customers are being delivered with. And, VCA is designed to deliver value to the customer at every single stage. It deploys advanced tools and methods, that boosts the satisfaction level of customers and encourage them to be loyal even in the long run. Value is defined in many ways. From getting the order placed to packaging, shipping and ensuring timely delivery of products and services, VCA keeps customers informed at every different stage. VCA makes use of advanced technologies such as geo-tagging, which ensures the order placed by customers are delivered to them within the given time. With all these factors, VCA plays a key role in retaining existing customers and also in attracting new customers, which is paramount for the growth of any business. Old ERP software consists of a rigid structure, which restricts business leaders in from customizing them according to new process requirements. They cannot be even integrated with the existing business system. And, at the pace technologies are being innovated, competition is growing and customers are getting tech-savvy, old ERP software is not the right match for getting diverse business solutions. Businesses rather need to implement an advanced BPM software such as Value Creation Automation (VCA), which deploys a robust approach to business functioning and growth. This is a technology-driven world and it never sleeps. Customers are active 24 x 7, through diverse media platforms such as desktop, mobile phones, tablets and social media networks. And, they demand round the clock availability of businesses. Be it for placing an order or be it solving the queries related to any particular product, customers expect an immediate response. These factors impact the buying decision of customers and lead to constant revenue generation for businesses. Old ERP software is not designed to help businesses in gaining competitive advantages as they are no more able to match the pace of the contemporary business world. VCA offers more than enhancing processes. With enhanced transparency and simplified communication, VCA boosts decision-making abilities of business leaders and helps in driving overall business performance. With BPM software such as VCA, businesses can successfully deliver value to customers and can grow exponentially even in the long-run.